The ginkgo is a very old tree--you might even call it prehistoric. 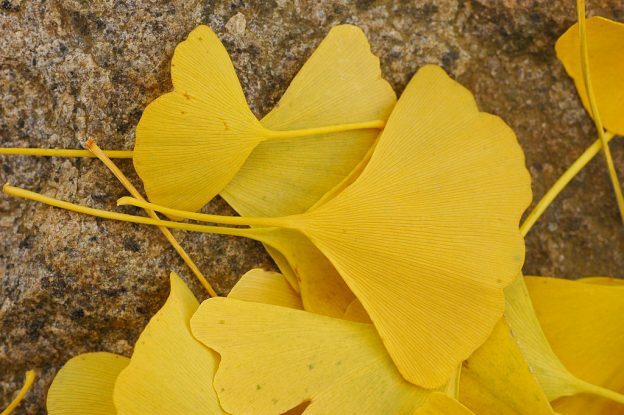 Fossils of ginkgo leaves have been found dating back 270 million years. The ginkgo tree was alive during the time of the dinosaurs. It survived the bombing of Hiroshima. It will survive us, still. I think of the ginkgo as the survivors' tree, and you will often find them in hospital gardens. Today, they are planted all over the world as an ornamental tree, and their resistance to pollution (and even atomic radiation!) makes them good choices for urban environments. The ginkgo is considered a sacred tree in the East, and associated with longevity. You can read more about the symbolic meaning of the ginkgo here. The ginkgo tree has distinctive fan-shaped leaves. Much like the mulberry, another very old type of tree, each leaf is a slightly different shape. You can read more about mulberries, here. Like the mulberries, the leaves of the ginkgo tree are temperature sensitive. They have been known to drop all their leaves overnight. In the past week or so, the ginkgo trees in my neighborhood have turned color and the sidewalks are covered with their beautiful yellow leaves. And today, snow is falling on the fallen leaves, this moment, timeless and beautiful. And if I remember correctly it's also spelled gingko. Incindentally, along Harlem Avenue in Berwyn just north of Pershing stands a row of these stalwart wonders.